» Forum » Electro-Mechanical » EM Pinball Hangout » Wedgeheads. Playability? I have room for a few more. » Wedgeheads. Playability? I have room for a few more. Wedgeheads. Playability? I have room for a few more. Hey All. I have room for about 8 Wedgheads. I'm starting to upgrade my machines. So whats the best playable machines out there? I'm just interested in fun playable machines and not machines you are emotionally attached to. Unfortunately I have not played them all so that's why I'm asking. If I can only have 8 I want them to be fun games. I have El Dorado, Sure Shot, Royal Guard and abra Ca Dabra ill probable keep them as I like the way they play. My others will probable be used as trading/selling. Well this is going to get you a ton of different opinions, but Atlantis is a fantastic player, as is King Pin. Jacks Open/Lucky Hand are also a ton of fun and keep you coming back. If you are looking for 8, you will likely take mostly what you can get until the space is filled up, unless they are easier to find in Kansas than Michigan. Plus others that will soon chime in. was at a friends place last week, and he has pins from wedgheads up to the hobbit. spent the most time playing target pool. I currently have 7 working machines. 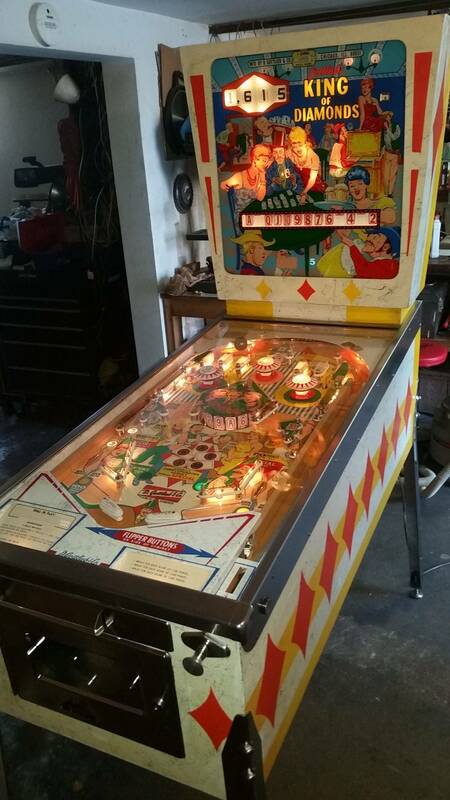 I have flipper clown thats fun to play and really nice shape but I don't play that one much. Bank a ball is cool but I would rather play shure shot. I do have Volley and it is a fun game. I'd pick 2001. It's such a fun game. Simple rules but definitely has that one-more game factor. Atlantis is brilliant because it’s one of the few games that awards you for aiming between drop targets. It’s very satisfying. It also feels like if White Water was made in the 70s. Instead of making your way through rafts, you have to nudge and aim your way through the numbers to get to the special. It’s an all around great game, imho. C37 is excellent as well: fill that thermometer up! My (somewhat unpopular) opinion though: wedgeheads are great and all, but I think multiplayer games are better, even if the rules aren’t as “deep.” The added competition factor with friends really makes multiplayer games a TON of fun. I picked up a Slick Chick two weeks ago and I can say that it is one of my favorite pin purchases to date. The rules are fairly straight forward, (Spell two words -in order- via pop bumpers) but the extra targets that complete the words for you provide a really good risk-reward scenario. With the flippers so far apart, you have to decide to just let it rip and take a pot shot at a bumper, or try to control the ball and take an aimed shot at a target. Every time you complete "Slick Chick", one of the mushroom rollovers goes from 1 point to 10 points. Once you complete it three times, the slings go from 1 point to 10 points. Complete it 5 times and it lights the center hole for a special. And that center hole, so much love-hate. It's awesome. I would add C37, Atlantis and Jacks Open to your line up. Royal Guard and Apollo were the most fun EMs I played of the ones I had time to play at the PHOF. I didn't have time to play KOD, Atlantis etc, hopefully next time. A plug for SweetHearts, hard game to master! 2001, Volley, Atlantis and Top Card seem to get played the most. Any addition to my collection would be another machine with drop targets. Abra Ca Dabra, Centigrade 37, El Dorado, King Pin to name a few. I like Team One over Abracadabra. There was something about the yellow I didn't like on Abracadabra. However, I also have my TO on novelty play, which is a freaking blast. This is the first game I tried it on that I actually loved it. Much more fun because it's 3 balls, and the points are crazy. The knocker goes nuts at each 50k shot. The only wedgehead besides Abra Ca Dabra I've owned personally so I could really evaluate long term value is Sky Jump, and I enjoyed it a lot, fun game. I love wedge heads. Being one player games with progressive rules, they bring Specials into play more than a normal game. I play them as if I am in an arcade pumping quarters. In other words I go for high scores and/or specials depending on how the game is progressing. Hearing multiple cracks in one game never gets old. Volley and 2001 are my favorites. along with quite a few others..
J.P is almost a daily thing, but that's a 4 player..
Volley, of course. I can't believe no one has mentioned Four Square yet. Flip a Card ... maybe consider a Williams game too. Thanks for all the input folks.. Looks like Atlantis and C37 will be on my hunt list. "King of Diamonds". This one is coming with me to Pinfest. I think it would be a mistake to only limit yourself to GTB wedgeheads. like Heat Wave and TradeWinds and King Pin. Would go 2 wedgies, 2 two-player, two wms ems, and two EM games (gun, otherwise). Gun Games... Go to the PHoF as he has a rifle games on the floor to consider. Good luck finding them all in original mint! Have to toss my favorite Wedge Head into the mix. The sadly under rated 4 Square. Nothing like getting all 4 rows of 4 lit, then hitting the special targets. Second choice, is Drop a Card - much more challenging than it looks. Of the ones I have owned Majorettes was my favorite. It's probably a contender for my all time favorite game. Of the several I have owned, Fun Park remains and still gets occasional play. Flipper was another good one.